Stay ahead of the curve and score a winning goal with JotForm’s Soccer Camp Registration PDF Template. 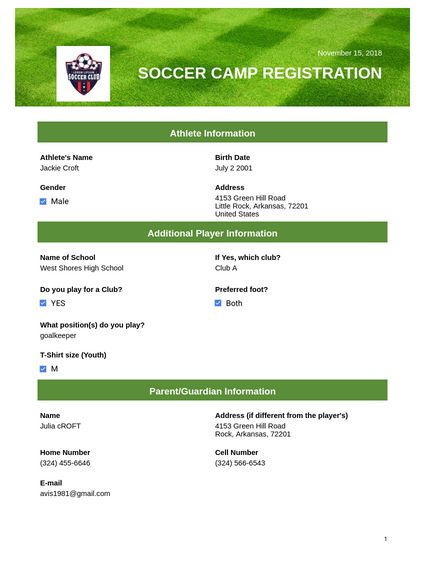 Specifically designed for soccer camp coordinators, this customizable template converts submitted registration forms into secure PDFs you can easily print or access on your digital device anytime, even while on the field. Pass the ball to JotForm’s PDF Editor, where you can change the template by editing information fields, rearranging the display, or adding your soccer camp’s logo. Once you’ve modified the template to your liking, your athletes’ registration information will be automatically converted to PDFs you can share with camp counselors and coaches. With JotForm, you can take your mind off data collection and keep your head in the game. Do you play for a Club? I hereby give my approval for my child’s participation in any and all activities prepared by the Soccer Camp during the selected camp. In exchange for the acceptance of said child’s candidacy by the Soccer Camp, I assume all risk and hazards incidental to the conduct of the activities, and release, absolve and hold harmless the Soccer Camp and all its respective officers, agents, and representatives from any and all liability for injuries to said child arising out of traveling to, participating in, or returning from selected camp sessions. In case of injury to said child, I hereby waive all claims against the Soccer Camp, including all coaches and affiliates, all participants, sponsoring agencies, advertisers, and, if applicable, owners and lessors of premises used to conduct the event. There is a risk of being injured that is inherent in all sports activities, including soccer. Some of these injuries include, but are not limited to, the risk of fractures, paralysis, or death.